Our 100 Hour Yoga Teacher Training syllabus weaves together ancient Vedic and yogic knowledge with the modern practices of science and teaching methodology so that after completion our students can be confident in their knowledge and abilities and ready to teach. New at Mahi Yoga: 100 Hour Yoga Teacher Training at three locations in India; Dharamshala, Goa, and Rishikes. This training is designed for those who find the longer 200 hr training unsuitable due to time or other constraints. 100 hour training allows our students to approach their yoga training at their own pace. After the completion of the 100 hr training the student will receive a certificate. *Price for 100 hour teacher training in Dharamshala. Prices for other locations can differ. For complete pricing list see here. 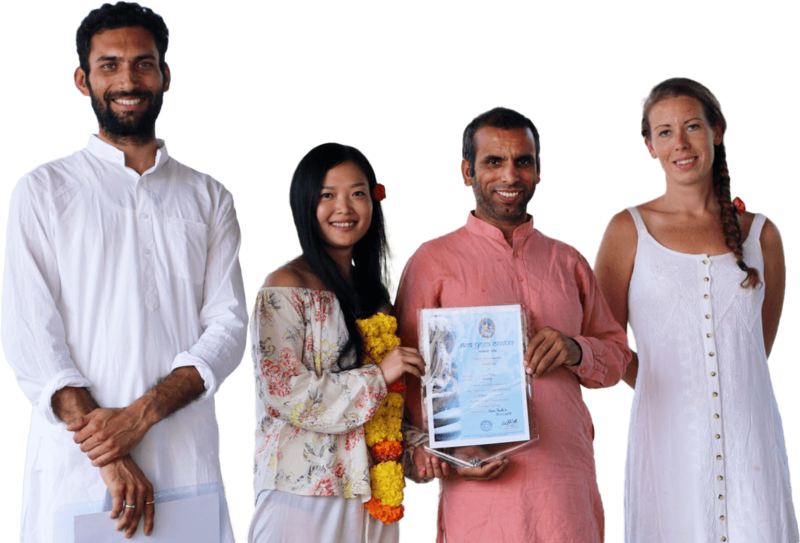 Why choose 100 Hour Yoga Teacher Training at Mahi Yoga? Not everyone can take a month off for a 200 hr training, but a two-week 100 hour training can be much more accessible and might prove to be a good option if you have a busy schedule. A 200 hr training is also very intensive so a 100 hr training can be a better choice if you have any conditions that require a lighter approach, or if you just want to take it easy. Since we offer the 100 hr training in three locations in India, it is a great choice if you’d like to travel and do the training. You can do 100 hr in one location and 100 hr in another! If you sign up for this training, you will take part in the first two weeks of a 200 hr training so your training will be completely the same as the 200 hr training. This will give you an option to join the second two weeks of our 200 hr training at another time or in a different location, and you will be eligible to receive the 200 hr Yoga Aliance certificate on completion of both courses. On the other hand, you might only be looking at completing the 100 hr Yoga Teacher Training and don’t plant to pursue your training any further. In this case, you will be eligible to receive the 100 hr Yoga Alliance Certificate which is valid worldwide. In either case, our carefully designed Multistyle Yoga training will teach you three main styles of yoga: Hatha (including traditional and therapeutic), AshtangaVinyasa and Vinyasa Yoga. In our 100 hour yoga course you will receive the foundational yoga knowledge and teaching techniques. The course will develop your skills as a yoga practitioner and a yoga teacher. Even though our trainings are aimed at prospective teachers, and you will also learn how to teach, all of the knowledge can also be applied to the individual practitioner. Therefore we recommend the 100 Hour Yoga Teacher Training for those who want to deepen their practice as well as those who wish to teach. This training course is the same as the first two weeks of the 200 hour multistyle course and you can see the syllabus for it below.